Iggies Beach Bar and Grill is currently closed due to hurricane damage caused by Irma & Maria. Until we rebuild we are keeping the Iggies spirit alive at a temporary locale, located pool side at Bolongo Bay, our new “Iggies Oasis”, so stop by for lunch, dinner, cocktails and a dip in the pool. And follow us on Facebook, Instagram and Twitter for updates. What once was and will be again in the future…. Iggies Beach Bar & Grill was voted Best Bar with Live Entertainment in The Daily News “Best of the VI” 2017, and has also been voted “Best Beach Bar” in the Caribbean twice by the readers of Caribbean Travel & Life, 2004 and again in 2012. Grab a barstool, or relax in a colorful Adirondack chair on the beach and breathe in the fresh ocean air, meet locals, mingle with visitors, order a bucket of VooDoo juice and let the good times begin! 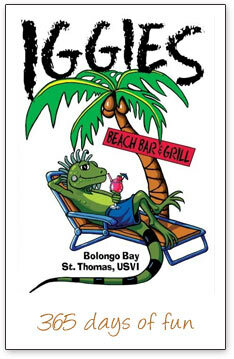 Located a few feet from the water’s edge, Iggies Beach Bar & Grill is an island hot-spot both day and night. Iggies is the only place on St. Thomas where you’ll find live entertainment 365 days a year, plus numerous sports TVs and even karaoke. Come for the fun and come hungry (and thirsty). Open for lunch, dinner and late-night cravings, Iggies Beach Bar & Grill serves up a full menu of Caribbean and American favorites. Begin by munching on our popular Spinach-Artichoke dip or West Indian Killer Conch Fritters, followed by Iggies Sliders or fresh grilled Mahi Mahi. Wash it all down with ice-cold beers by the bottle or cool cocktails featuring the US Virgin Islands own Cruzan rum. Definitely not to be missed is Iggies famous Wednesday Carnival Night Extravaganza with limbo show, live steel pan Calypso music, Mocko Jumbie dancers and more! Our Carnival Night takes place every Wednesday night from Thanksgiving through the month of August. All of this, plus the friendliest staff in the Caribbean, have made Iggies a favorite spot for visitors and locals. Check out more photos and upcoming events at www.IggiesBeachBar.com.